"It still amazes me how little we really knew... Maybe everything that happened to me and my family had nothing at all to do with the slowing. It's possible, I guess. But I doubt it. I doubt it very much." On a seemingly ordinary Saturday in a California suburb, Julia and her family awake to discover, along with the rest of the world, that the rotation of the earth has suddenly begun to slow. The days and nights grow longer and longer, gravity is affected, the environment is thrown into disarray. Yet as she struggles to navigate an ever-shifting landscape, Julia is also coping with the normal disasters of everyday life - the fissures in her parents' marriage, the loss of old friends, the hopeful anguish of first love, the bizarre behavior of her grandfather who, convinced of a government conspiracy, spends his days obsessively cataloging his possessions. As Julia adjusts to the new normal, the slowing inexorably continues. "Is the end near? In Karen Thompson Walker's beautiful and frightening debut, sunsets are becoming rarities, "real-timers" live in daylight colonies while mainstream America continues to operate on the moribund system of "Clock Time," and environmentalists rail against global dependence on crops that guzzle light. Against this apocalyptic backdrop, Walker sets the coming-of-age story of brave, bewildered Julia, who wonders at the 'malleable rhythms' of the increasingly erratic adults around her. Like master fabulists Steven Millhauser and Kevin Brockmeier, Karen Thompson Walker takes a fantastic premise and makes it feel thrillingly real. In precise, poetic language, she floods the California suburbs with shadows and a doomsday glow, and in this altered light shows us amazing things about how one family responds to a stunningly imagined global crisis." - Karen Russell, author of Swamplandia! The information about The Age of Miracles shown above was first featured in "The BookBrowse Review" - BookBrowse's online-magazine that keeps our members abreast of notable and high-profile books publishing in the coming weeks. In most cases, the reviews are necessarily limited to those that were available to us ahead of publication. If you are the publisher or author of this book and feel that the reviews shown do not properly reflect the range of media opinion now available, please send us a message with the mainstream media reviews that you would like to see added. The setting is in a small California town and is narrated by an 11 year old girl whose world is drastically changed as day by day the earths' rotation around the sun is shortened. Never knowing what to expect, she tries to maintain life as she's known it---part of a family consisting of mother, father and grandfather, in school where she struggles with friendships and the always difficult coming-of-age problems of self esteem, body image, and fashion all while trying desperately to attract the attention of one particular boy. Meanwhile, society is disintegrating ---there are battles between those trying to live by the 24 hr. "clock time" and those living on "physical time" corresponding with the ever lengthening hours of daylight and darkness. All the simple activities of daily life are altered, the food supply is at risk leading to hoarding and growing vegetables and fruits under artificial lights, utilities are strained, severe climate changes occur, and eventually solar radiation takes the lives of the people who venture out in the sunlight. This book is very thought-provoking, offering no solutions, but leaving one with a deeper appreciation of life as we know it today. I rarely find debut novels truly great, but The Age of Miracles surprised me. The Age of Miracles is Julia's recollection of the day everything changed. It was disturbing and the voice of the young protagonist, Julia, was haunting. I highly recommend this book for adults and young adults alike. This book will stick with you; I loved it, and it's a book that I won't soon forget. Julia is a normal 6th grader, but nothing in the world is normal. Not only does she have the daily life issues - first love, friend that dumps her - but the Earths rotation is slowing down and days are growing longer every minute. The world's crisis is told from her point of view; this is not a scientific book that explains what and why in a scientific manner. Rather, it shows the catastrophic 'slowing' from a personal level from real people; a young girl and her parents. Get this book; you will not be sorry. From the first page this book captured my heart. Julia, the young narrator of the story, feels very real, and the author's ability to show how people react to changing circumstances is uncanny. Not only is the story intriguing, the author's use of spare, elegant language, along with her insights into human nature, make this a must-read book. Once I started it, I could not put it down, and I've recommended it to several friends. 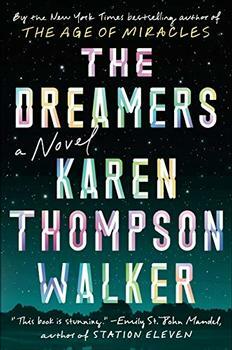 I look forward to more work from Karen Thompson Walker. From start to finish, I found this book riveting. The Age of Miracles tells the story of young girl coming of age right as the world as we know it, ceases to exist. The impossible becomes possible and rotation of the earth begins to slow, days become longer, nights become colder, the laws of gravity fail us and all through these miraculous times, Julia still experiences the normal growing pains of a young girl. The lose of friendships, her first crush, buying a bra and everything in between. The world around Julia may be changing, but her story is timeless. A beautiful book. It captured me on the very first page as it realistically captured the normal insecurities of an eleven year old girl and her fears in dealing with a world falling apart. As the earth's rotation slows, the events of everyday life are no longer certain. The things she could always count on are no longer so. Not only is it easy to draw parallels with the world in which we are all living, the sequence of events in the book all seem entirely feasible. While reading I found myself feeling that I was in the altered world in which the characters lived. I started reading the book on a Saturday morning and did not put it down until I finished. The story unfolds in a way that makes it easy to see how these events could happen. I found myself thinking about the book long after I finished. A sure sign of a great book.